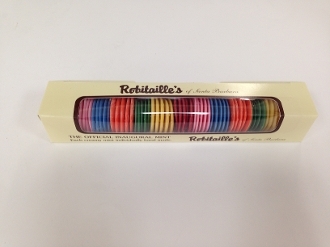 For over 50 years these creamy hand made mints have been a Santa Barbara tradition. In 1985, we were chosen the "Official Mint of the 50th Presidential Inauguration." Today, we specialize in the multi-colored creamy mints. Each mint is individually hand made and packaged on our premises in Santa Barbara county. Sugar, partially hydrogenated palm kernel oil, cocoa butter, whey, nonfat milk, cocoa (processed with potassium carbonate), mono and diglyceride, sorbitan monostearate, soya lecithin emulsifiers, vanilla, oil of peppermint, natural and artificial flavor, artificial color (may contain Yellow 5, 6 Lake, Blue 1 Lake, Red 3, Red 40 Lake).